Just thought I share my Christmas card with. Not had much time this year to make all my friends and family a Christmas card, managed to make a few. 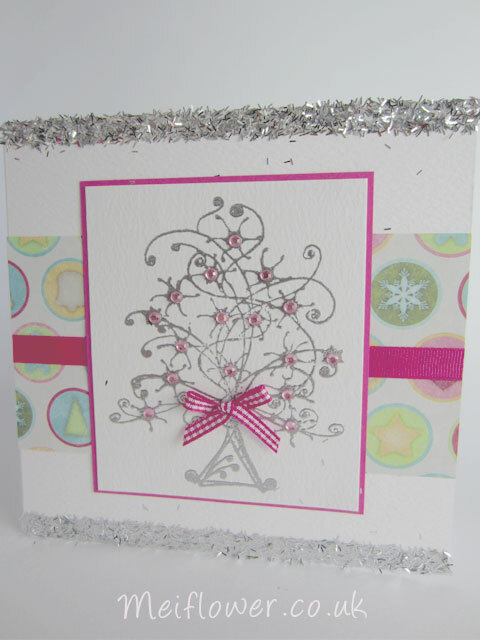 I have used a Christmas Tree stamp from Dimension Stamps, Christmas paper I had in my stash. A piece of cerise grosgrain ribbon. I have used double sided tape on the top and bottom edge of the card, sprinkled tinsel effect glitter which I bought from Glitter Magic at the Craft show at the NEC. I love this Christmas Tree stamp, I think it is quite a timeless design which I would use again and again. 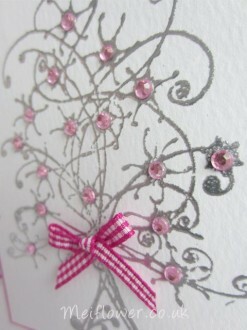 I have embossed the tree with silver embossing powder to give a more of a contemporary feel. I have finished off the card with self adhesive pink gems and a cerise pink gingham bow. This entry was posted on Sunday, December 18th, 2011 at 3:58 pm	and is filed under Christmas Cards. You can follow any responses to this entry through the RSS 2.0 feed. You can leave a response, or trackback from your own site. Hello Mei. This is such a pretty card. I love your design, the tree stamp is fabulous, and I love how you have embossed and then added gemstones, so beautiful and very classy. I am sure that whoever recieves one of your cards, will be absolutely thrilled, its gorgeous. Absolutely gorgeous. I love how it´s soo untraditional and I´m sure too, that whoever gets one of these will be just thrilled about it. really gorgeous work, I just love it. Hi Mei, its been a long time just popped by to see whats happening in your blog and found this …. the stamp is gorgeous and so is the design. sioban..lovely cards i was at the leigh show i enjoyed it.purched ribbon and made the horseshoe.in white ribbon i love it.next one is the christmas wreath i would love to purchase your christmas stamp x.x. Hi Sioban. Thank you for your lovely comment. The stamp from Dimension Stamps, If you have any problem getting it, let me know.